Like many musicians, my 'job' is a cobbled-together combination consisting of of private teaching, church work, orchestral player, pit musician, etc. I conduct a youth orchestra and am the music director (currently an unpaid gig)at a young-but-growing non-profit arts school. My work calendar roughly corresponds to the school year in that there is a crush of things all at once at Christmas time (concerts, recitals, church music) and in the spring at the end of the year. The period of time between Easter and early June is particularly intense, and I always survive it by reminding myself that summer is a-coming. And every year this surprises me. Every summer, I catch myself at some particularly stressful time and ask myself, "Wait a minute.... wasn't summer supposed to feel like 'less'?" And we musicians work way into the future. I got a call the other day for a big wedding gig on the Island in October. I am spending time with the other teachers, planning and shaping our class offerings for fall. Concerts are already planned for all of next season, and now is the time to choose music, secure venues, etc. I'm also in school, finishing the last of my coursework this summer. I still have a thesis to write somewhere on top of all the fall demands. And it's looking like I'll be teaching some at the University this fall. As my brain swimmingly juggles all the details, I'm doing some hard evaluating. As I'm faced with some possibly hard choices for fall I realize that there isn't a lot that I really want to do without. I know I'll never stop private teaching (though perhaps 15-18 students instead of 30+ is more reasonable)and you'd have to wrest the baton of my youth orchestra from my crippled hands to get me to give that up. Still, I need to remember to enjoy the small things on the way...the wedding I'm playing on the shore of Lake Michigan on Saturday will give me a chance to just BE for a bit. Sounds like a terrific summer ahead. I always liked my wife's motto: "I'll rest when I'm dead." It is worth following, although at a slightly slower pace during the summer. You sound as if you have a good balance. Have fun. Dottie, where is Rudyard? I am. Lake Michigan girl originally (grand haven) and soooo miss it!! Loved your mother's day post and so identify with this one-so many wonderful things to do-but so hard to give ourselves space to enjoy it! 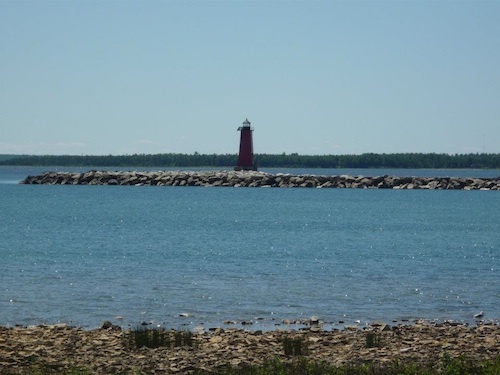 Kathryn, Rudyard is in the Upper Peninsula about halfway between St. Ignace and Sault Ste. Marie, roughly halfway between the Mackinac Bridge and the International Bridge. From my house, I can drive from 20 to 40 minutes and be at the shores of 3 of the Great Lakes, Lakes Superior, Huron and Michigan. Mackinac Island is 'local' for us, and my orchestra is in Canada. It's a very lovely place. Sadly, I find myself working too much and not taking advantage of the area as I should. I saw a bumper sticker the other day that says something like "I live where you vacation". That's us. Not many people, not much money but a beautiful place. My dad is from Iron Mountain and we still have family in the lower part of MI. Twice I have been lucky enough to take my own family to MI from Berkeley, CA. On one of those trips we drove that stretch of highway. It was incredibly isolated but like all of Michigan is beautiful. I'm amazed you can find 30 students in that area. How much commuting do you (or they!) do?